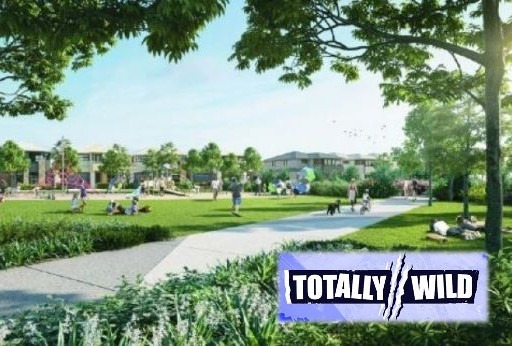 Ranger Stacey from Totally Wild visited our Stocklands Aura site in 2018 to film a story on recycling topsoil. She says: "Healthy soil provides the foundation for ecosystems. Plants and animals need it and so do we. It all starts with soil so if this precious resource can be recycled, that’s a good thing. 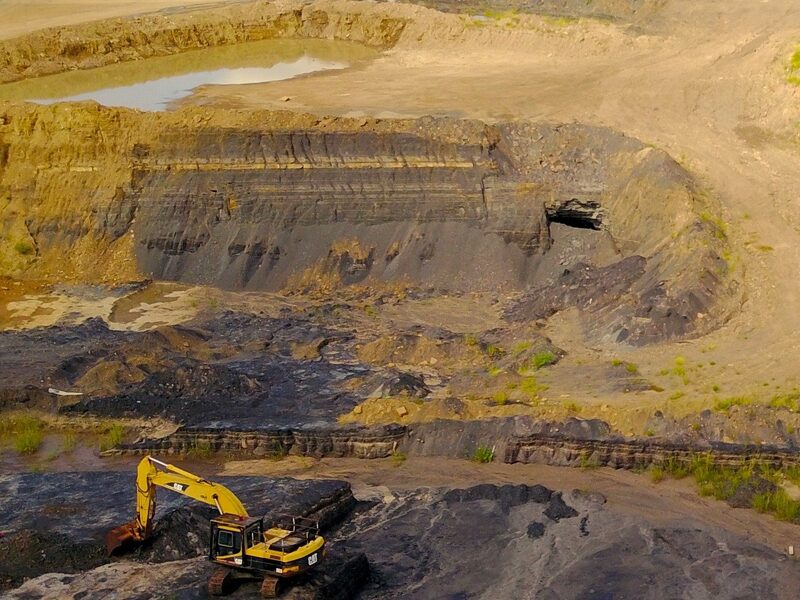 With all the communities that are popping up, tons and tons of topsoil usually get scooped up and taken away but instead of all this dirt being dumped forever, it’s being recycled. " There are thousands of illegal dump sites across the country that are potential health and environmental hazards. SoilCyclers Alison Price said they can be anywhere and cost communities millions of dollars to clean them up. 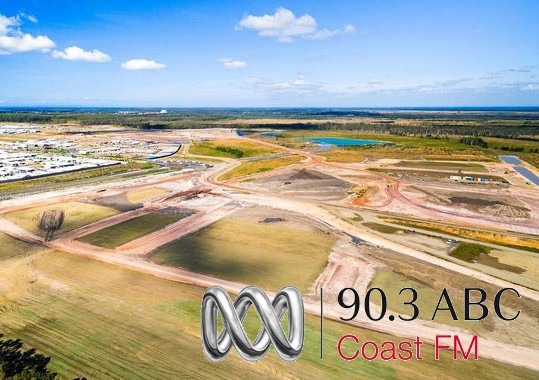 Alison who started SoilCyclers 9 and a half years ago now works with developers onsite at large scale developments like Caloundra South to keep about 500 truck movements off the road every week. A lot of the time the soil that is on a site is degraded and not necessarily suitable for landscaping.We add to it to improve it rather than that soil being trucked away. Its a big savings for developers to reuse their site soil. They want really good results, they want their parks and green spaces to look amazing and by ameliorating the topsoil they’ve found that their trees grow twice as fast. We get to do the right thing for the environment as well as making money and saving clients money at the same time. 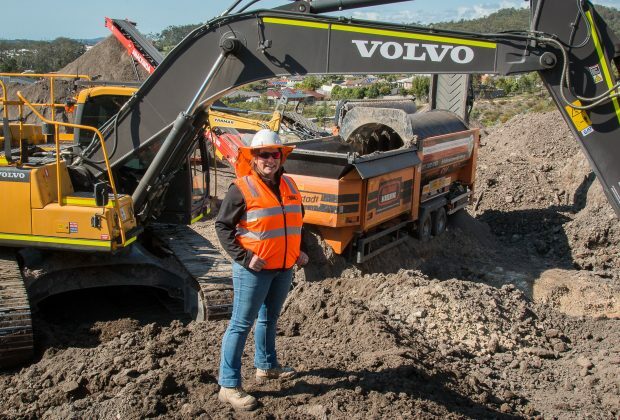 For years Alison Price referred to herself as the office manager of her now multi-million dollar company SoilCyclers, as she competed with the big boys on major road and construction projects. Now almost 10 years in she has the confidence to refer to herself as managing director and is slowly leading the charge of women into the traditionally male dominated industry. 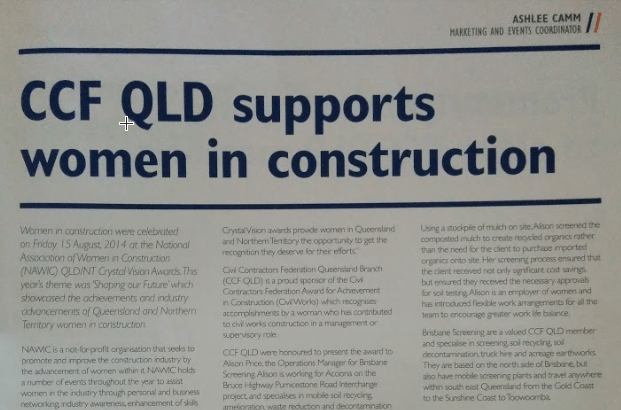 What's it like to work in the male dominated construction industry? Alison tells all about breaking into this "blokey" line of work. 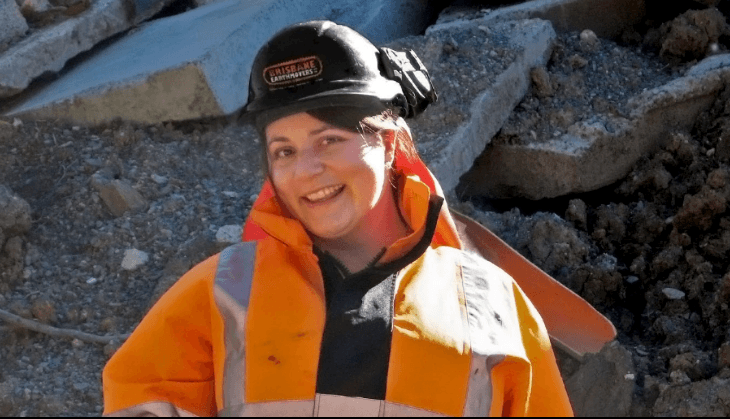 Alison now oversees topsoil recycling projects for more than 50 sites a year but starting out was "really daunting". Although predominantly a simple process, soil treatment and replacement can be an expensive business when you factor in transport costs and the purchase of new top soil. Offering services using Australia's first road-registered mobile trommel eliminated these costs. "We definitely have the best machine in the business," says company founder Alison Price. 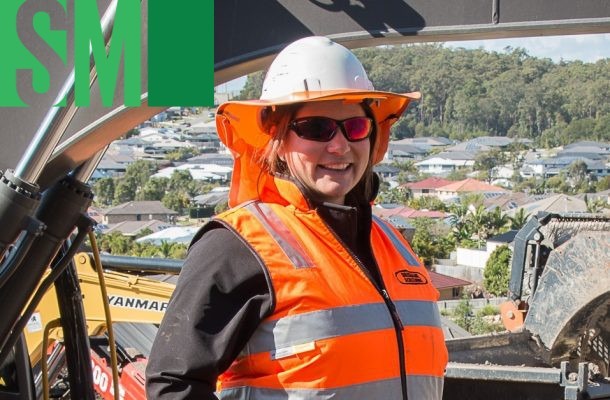 CCF QLD were honoured to present the award to Alison Price who is working on the Pumicestone Road Interchange project and specialises in mobil soil recycling, amelioration, waste reduction and waste management. 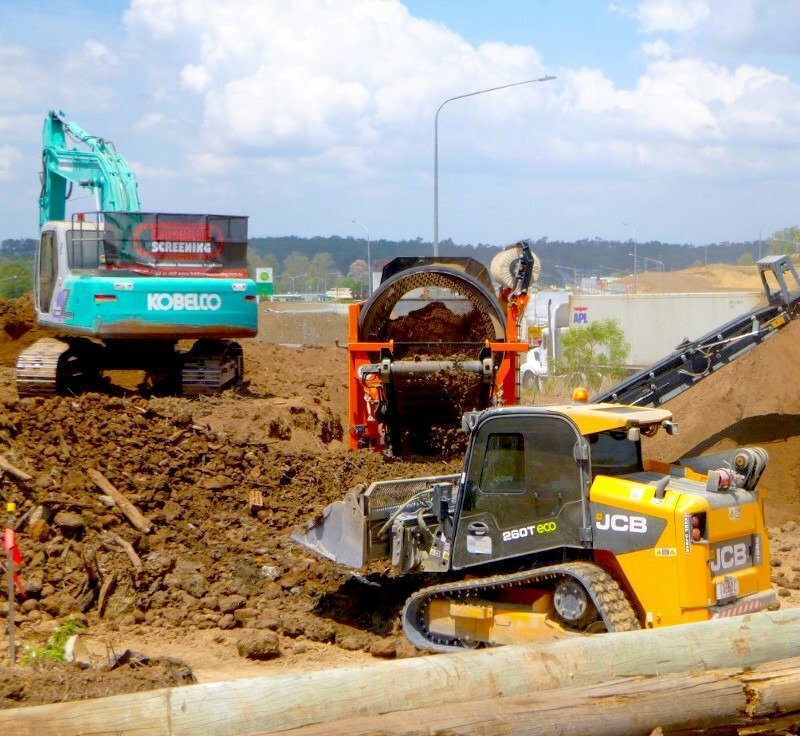 Alison provided her client with savings of a half a million dollars through mobile soil recycling, a more cost effective alternative to moving topsoil into the project. Specialising in recycling onsite so that products can be reused rather than transported off-site and replaced with imported materials. Site soil can be blended with recycled imported ameliorants to produce quality topsoil for half the price of imported soil. The company’s combination of advanced technology and extensive experience allows it to guarantee the lowest wastage or oversize rate of anyone in southeast Queensland.